It's all going on over at our Twelve by Twelve Blog. 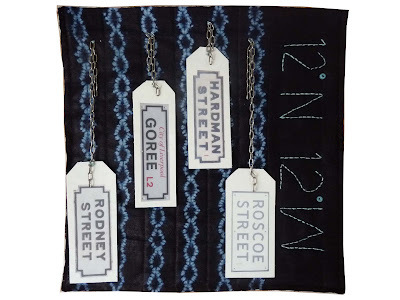 Pop over to see the reveal of our twelfth joint challenge - appropriately the theme was itself Twelve. This is my contribution, the inspiration being the co-ordinates embroidered down the side. Want to know what it's all about? The explanation is on my post on the group blog! Helen! That's the wrong blog link. It lead me to a blog about record album cover art. Yikes! I saw pictures of men with little clothing. Are you sure you meant to send us there? Perhaps the link is not correct. Your contribution to 12 by 12 is very moving and thought provoking. It must have taken considerable time to research. BTW everyone I am the lurker who won the very generous stay in the Christchurch Hotel Helen offered on her blog. My husband and I are still smiling and excited at the thought.